Pakistan's parliament has decided against military involvement in the Saudi-led coalition fighting Houthi rebels in Yemen, after days of debate. Lawmakers voted unanimously in favour of a resolution that "Pakistan should maintain neutrality" in Yemen. Saudi Arabia had asked Pakistan last month to contribute ships, aircraft and troops to the campaign to restore President Abdrabbuh Mansour Hadi. Meanwhile, two planes have delivered relief supplies to Yemen's capital. The aircraft were carrying medicines, bandages and surgical equipment from the International Committee of the Red Cross (ICRC) and the UN Children's Fund (Unicef). The organisations had to wait days before receiving clearance from all sides in the conflict for the flights to Yemen, where the UN says basic services are unravelling, with widespread food and fuel shortages. 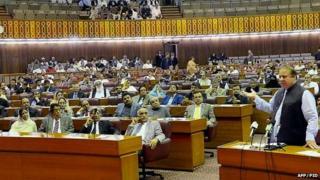 Pakistan's parliament began debating whether to join the coalition on Monday. Although Saudi Arabia is an ally, many lawmakers spoke out against sending troops to Yemen. Friday's resolution backed the Pakistani government's commitment to protect Saudi territorial integrity and Islamic holy places located inside the kingdom. "The parliament of Pakistan expresses serious concern on the deteriorating security and humanitarian situation in Yemen and its implications for peace and stability of the region," the resolution said. "[It] desires that Pakistan should maintain neutrality in the Yemen conflict so as to be able to play a proactive diplomatic role to end the crisis." Saudi Arabia has been a major foreign donor to Pakistan - some say perhaps the third-largest after the US and China. Late last year, for example, what finance minister Ishaq Dar initially described as a $3bn (£2bn) "gift from a friendly source" turned out to be Saudi largesse that was used to stabilise a free-falling rupee against the US dollar. Soon afterwards Pakistan officially backed the Saudi position on Syria. So some resentment in Saudi quarters is to be expected from this vote. But Pakistanis have still left room for a troop deployment in Saudi Arabia if not in Yemen, which Saudis will certainly need if the conflict in Yemen drags on for longer. There is a precedent for this. During the first Gulf War in 1991, Pakistan deployed two brigades to "defend holy sites" in Saudi Arabia. The only other example of a Pakistani troop deployment abroad is to Jordan during the "Black September" of 1970, to help that government put down a Palestinian insurgency. The coalition of nine mostly Sunni Arab states is seeking to "defend the legitimate government" against the Houthis, a Zaidi Shia rebel movement that the US and Saudi Arabia allege is receiving military assistance from regional Shia power Iran. Analysts say Pakistan, which has a Sunni majority but also a sizeable Shia minority, fears being caught between the two if it sends troops to Yemen. Earlier this week, Iranian Foreign Minister Mohammad Javad Zarif travelled to Islamabad to urge Pakistan's leaders to reject the Saudi request. The rebels and allied army units loyal to Yemen's ousted former President Ali Abdullah Saleh took full control of Sanaa in January and placed Mr Hadi under house arrest. He escaped and took refuge in Aden in February, but left the country at the end of March when the Houthis reached the outskirts of the southern port city. More than two weeks of air strikes have failed to halt the Houthi advance into Aden, as well as neighbouring southern and eastern provinces. Overnight, coalition aircraft targeted the defence ministry building in Sanaa and weapons storage sites. On Thursday, the UN's humanitarian co-ordinator for Yemen called for a humanitarian "pause" in the bombardment and fighting on the ground to allow in urgent aid deliveries. Johannes van der Klaauw told reporters in Geneva that the conflict had now spread to 15 of Yemen's 22 provinces. He described the situation in Aden in particular as "catastrophic", a descent into urban warfare, with control of the air and seaports shifting daily between rival groups. A million people in the city risked being cut off from access to clean water within a matter of days unless additional fuel is brought in, he said. The World Health Organisation (WHO) says almost 650 people have been killed and more than 2,200 have been injured since 19 March, but Mr van der Klaauw said the actual number of casualties was likely to be far higher because many were not being brought to hospital or were being buried immediately. Houthis - The Zaidi Shia Muslim rebels from the north overran Sanaa last year and then expanded their control. They want to replace Mr Hadi, whose government they say is corrupt. The US alleges Iran is providing military assistance to the rebels. Saudi-led coalition - A US-backed coalition of nine, mostly Sunni Arab states says it is seeking to "defend the legitimate government" of Mr Hadi.